This first featured book of my nonfiction celebration of Black History month is one that I am so excited about. When I saw this one, I knew that I had to own a physical copy of it. It's a massive book. Including the epilogue, but excluding the notes on methodology and the index, this is a tome worthy five hundred thirty eight pages. It's going to be a commitment to read, and I will more than likely break it up into parts in order to get through it, but get through it I will! 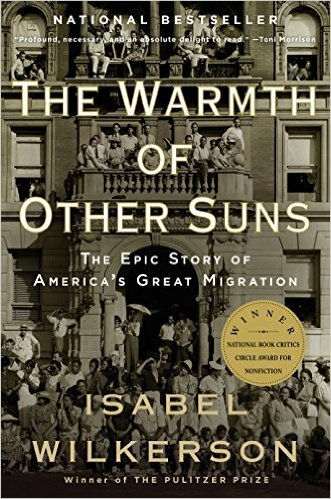 In this epic, beautifully written masterwork, Pulitzer Prize–winning author Isabel Wilkerson chronicles one of the great untold stories of American history: the decades-long migration of black citizens who fled the South for northern and western cities, in search of a better life. From 1915 to 1970, this exodus of almost six million people changed the face of America. Wilkerson compares this epic migration to the migrations of other peoples in history. She interviewed more than a thousand people, and gained access to new data and official records, to write this definitive and vividly dramatic account of how these American journeys unfolded, altering our cities, our country, and ourselves.